Upon arriving at the MCA, you will find stairs covered with Tatsuo Miyajima's symbolic numbers. 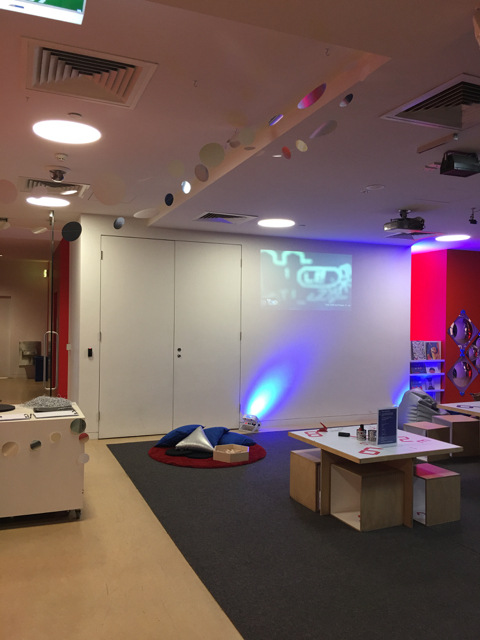 Before heading to the exhibition, do pop in at the Visitor Information Desk for a special Tatsuo Miyajima Kids Activity Trail where kids are asked to find certain artwork, observe the artwork and write some answers down. They are also reminded to look closely but not to touch the artwork. Little Miss is 4 so she wasn't able to read this activity trail but we managed to do a few things on the trail which made the exhibition visit interesting. She also liked counting the goldfish in the exhibition pond - can your little one spot 10? Tatsuo Miyajima's work explores three big ideas: keep changing, connect with everything and continue forever and invites visitors to experience his extensive career from early light-emitting diodes (LEDs) prototypes through to large-scale environments, as well as video and performance work. Some of his work such as Mega Death (room-scale installation of brilliant, blinking blue LEDs) and Counter Coal (vast black mound of coal with a train set) are representations of the lives lost during the Second World War in Hiroshima and Auschwitz. Something that little Miss is too young to understand but a very touching thought thinking that each LED is representative of a human life and their energy. Another representative piece and highlight of this exhibition is Arrow of Time (Unfinished Life) which we found quite calming. 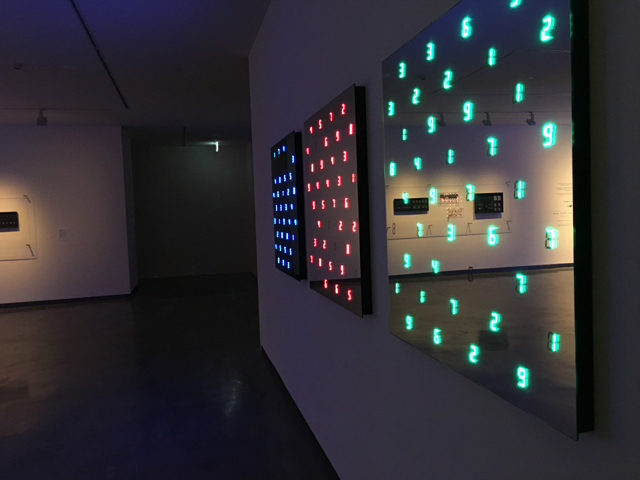 Tatsuo Miyajima's work is repetitive in a way with its use of numerical counters that count from 1 to 9 using LEDs which stop at times and turn the room into darkness and light again which both represent time. Little Miss is very much into numbers and letters at the moment so this was great for her to identify numbers throughout the exhibition and counting the fish in the pond. 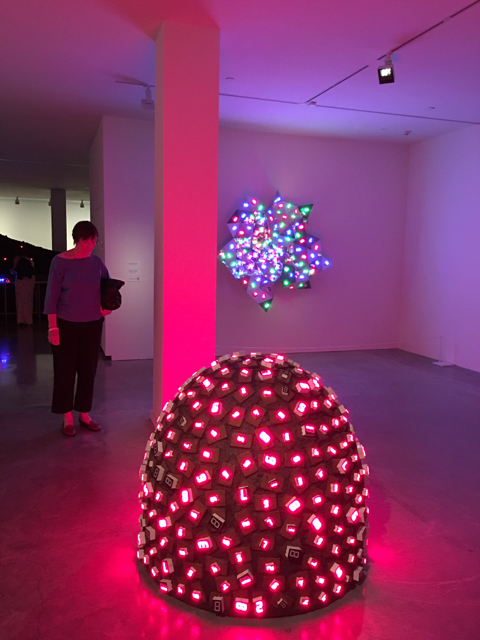 After the exhibition, head to the Tatsuo Miyajima Family Space also on level 3 opposite the exhibition entrance. It is Free and opened to visitors of all ages during the exhibition, check the museum's website for times. Children can take part in art-making activities, turn light into music or meditate on a larger than life lotus leaf. 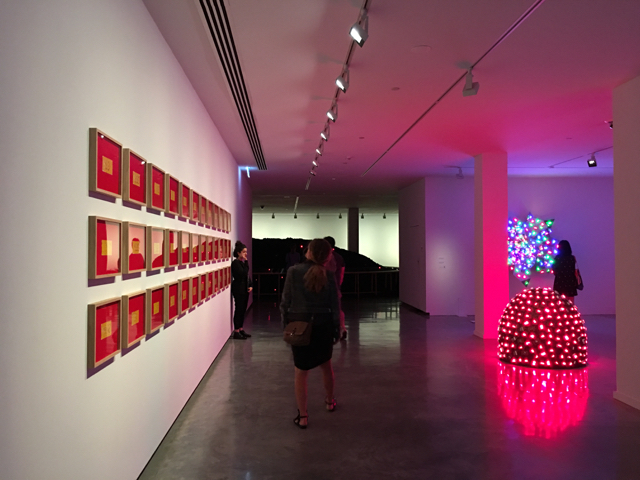 We definitely recommend a visit to Tatsuo Miyajima: Connect with Everything at the MCA when you are heading to the city next. 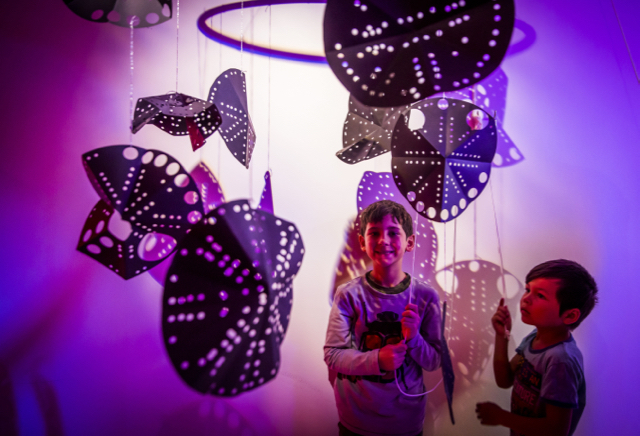 Great for kids to visit as the exhibition is free for children under 12, it also has a family space as well as other free exhibitions throughout the museum and great for their maths too - ha! After your visit, head to the MCA Café for a Tatsuo Miyajima inspired menu which includes kid friendly meals or head to the Cherry Blossom Bar and enjoy their venue, food and cocktails also inspired by Tatsuo Miyajima. Tatsuo Miyajima: Connect with Everything is now open until the 5th of March 2017. Head to the MCA's dedicated page for more info. For more ideas and reviews for what to do with kids around Sydney, head to our blog where you will find reviews as well as useful guides like our Daily Spots List.